This article is about the poem by Robert Burns. For other uses, see Tam o' Shanter. "Tam o' Shanter" is a narrative poem written by the Scottish poet Robert Burns in 1790, while living in Dumfries. First published in 1791, it is one of Burns' longer poems, and employs a mixture of Scots and English. The poem describes the habits of Tam, a farmer who often gets drunk with his friends in a public house in the Scottish town of Ayr, and his thoughtless ways, specifically towards his wife, who is waiting at home for him, angry. At the conclusion of one such late-night revel after a market day, Tam rides home on his horse Meg while a storm is brewing. On the way he sees the local haunted church lit up, with witches and warlocks dancing and the Devil playing the bagpipes. He is still drunk, still upon his horse, just on the edge of the light, watching, amazed to see the place bedecked with many gruesome things such as gibbet irons and knives that had been used to commit murders and other macabre artifacts. The witches are dancing as the music intensifies and, upon seeing one particularly wanton witch in a short dress he loses his reason and shouts, 'Weel done, cutty-sark!' ("cutty-sark": short shirt). Immediately, the lights go out, the music and dancing stops and many of the creatures lunge after Tam, with the witches leading. Tam spurs Meg to turn and flee and drives the horse on towards the River Doon as the creatures dare not cross a running stream. The creatures give chase and the witches come so close to catching Tam and Meg that they pull Meg's tail off just as she reaches the Brig o' Doon. For honest men and bonnie lasses). By Alloway's auld, haunted kirk. Wi' usquabae, we'll face the devil! With the scene set, suddenly: "wow! Tam saw an unco sight!" The poem first appeared in the Edinburgh Herald and the Edinburgh Magazine in March 1791, a month before it appeared in the second volume of Francis Grose's Antiquities of Scotland, for which it was written. Robert Riddell introduced Burns to Grose, and according to Gilbert Burns, the poet asked the antiquarian to include a drawing of Alloway Kirk when he came to Ayrshire; Grose agreed, as long as Burns gave him something to print alongside it. On a market-day, in the town of Ayr, a farmer from Carrick, and consequently whose way lay by the very gate of Alloway kirk-yard, in order to cross the River Doon, at the old bridge, which is almost two or three hundred yards farther on than the said old gate, had been detained by his business till by the time he reached Alloway it was the wizard hour, between night and morning. Though he was terrified with a blaze streaming from the kirk, yet as it is a well known fact, that to turn back on these occasions is running by far the greatest risk of mischief, he prudently advanced on his road. 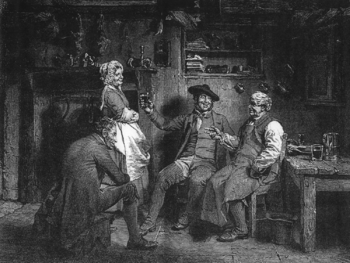 When he had reached the gate of the kirk-yard, he was surprised and entertained, thorough the ribs and arches of an old gothic window which still faces the highway, to see a dance of witches merrily footing it round their old sooty black-guard master, who was keeping them all alive with the power of his bagpipe. The farmer stopping his horse to observe them a little, could plainly desern the faces of many old women of his acquaintance and neighbourhood. How the gentleman was dressed, tradition does not say; but the ladies were all in their smocks; and one of them happening unluckily to have a smock which was considerably too short to answer all the purpose of that piece of dress, our farmer was so tickled that he involuntarily burst out, with a loud laugh, 'Weel luppen, Maggy wi' the short sark!' and recollecting himself, instantly spurred his horse to the top of his speed. I need not mention the universally known fact, that no diabolical power can pursue you beyond the middle of a running stream. Lucky it was for the poor farmer that the river Doon was so near, for notwithstanding the speed of his horse, which was a good one, against he reached the middle of the arch of the bridge and consequently the middle of the stream, the pursuing, vengeful hags were so close at his heels, that one of them actually sprung to seize him: but it was too late; nothing was on her side of the stream but the horse's tail, which immediately gave way to her infernal grip, as if blasted by a stroke of lightning; but the farmer was beyond her reach. However, the unsightly, tailless condition of the vigorous steed was to the last hours of the noble creature's life, an awful warning to the Carrick farmers, not to stay too late in Ayr markets. Thus began what was to be one of Burns' most sustained poetic efforts. The story that the poem was written in a day was perpetrated by John Gibson Lockhart, aided by Allan Cunningham. Its subtle nuances of tempo, pace and tone suggest that it had been given, as Burns told Mrs Dunlop on 11 April 1791, "a finishing polish that I despair of ever excelling". Burns based the character of Tam O'Shanter on Douglas Graham (1739–1811), a friend who lived at Shanter Farm, about half a mile (0.8 km) inland from the fishing village of Maidens in South Ayrshire, near Kirkoswald. Lay stinking, vile in every neuk. A handwritten note on the manuscript written by Judge Alexander Fraser Tytler, reads "Burns left out these four lines at my desire, as being incongruous with the other circumstances of pure horror." Burns had the lines removed from later editions; it was not unknown for Burns to make changes at the request of friends. 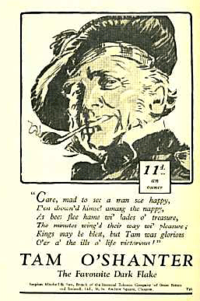 The Tam o' Shanter cap is named after the poem. Lady Ada Lovelace named her beloved if "very wild and ... quite vicious" stallion Tom O'Shanter. George Métivier published Tam au Sabbat, a Guernésiais version of Burns' poem, in La Gazette de Guernesey in 1855. This version was included in his collection Fantaisies guernesiaises in 1866. In 1899, the town of Barre, Vermont erected a memorial to Burns in local granite, including a panel depicting a scene from the poem. In 1955, British composer Malcolm Arnold's Overture Op. 51a was named "Tam o' Shanter" after Burns' poem. In the 1990s, Scottish figurative painter Alexander Goudie worked at a cycle of 54 large format paintings dedicated to Robert Burns' poem, currently displayed at Rozelle House Galleries, near Burns' home at Alloway, Ayrshire. The Tam O' Shanter Urban Cottage on Bidston Hill, Wirral, Merseyside was named after the poem in 1837 after being built beyond a stream which was said to repel witches. It attracts both Robert Burns fans and local witches and Wicca historians. The Tam O'Shanter Inn in Glendale, California was named after the Robert Burns poem and was established in 1922 by the Van de Kamp bakery family. As of 2017, it is Los Angeles' oldest restaurant operated by the same family in the same location. It was Walt Disney's favorite restaurant. "The Number of the Beast" by Iron Maiden is loosely based on the poem. ^ Letter from Robert Burns to Alexander Fraser Tytler, Esq., April 1791, The Complete Works of Robert Burns (Self-Interpreting), Volume IV, Gebbie & Co., Philadelphia (1886), pp. 250–251. ^ Lovelace as quoted in The Thrilling Adventures of Lovelace and Babbage by Sydney Padua, p. 119. ^ "The Goudie Collection @ Rozelle". goudie.co.uk. Full text of the poem from Project Gutenberg. This page was last edited on 22 January 2019, at 15:23 (UTC).